A Morticia-like Medea, Hai-Ting Chinn sings a difficult role with charm and force. A very old opera sounds as fresh as tomorrow. Cecilia Gault (Apollo), Dante Vega Lamere (Cupid), Mark Uhlemann (Hercules), Nathan Baer (Besso), Cherry Duke (Jason), Hai-Ting Chinn (Medea), Matthew Singer (Aegeus), Patrick Murray (Orestes), Isai Jess Munoz (Demo), Karim Sulayman (Delfa), Katharine Dain (Hypsipyle), Sharin Apostolou (Alinda). 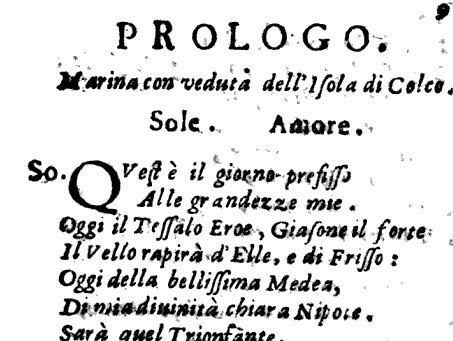 Giasone, which premiered in 1649, was the most popular opera of 17th century Italy. Why is not hard to guess today. It is a perfect blend of farce and melodrama. The creators may not have had Ru Paul in mind, but there she is large as life at Poisson Rouge. Karim Sulayman in drag sings a delightful duet with Isai Jess Munoz as the typical farce hunchback who stutters as he speaks, sings and even as he walks. Both singers exhibit a wild vitality that typifies this Opera Omnia production. They are appropriately robust and crude in their comic takes. Wesley Chinn, whose company produced, wanted to make this opera viable in the 21st century and found inspiration for interpretation in Commedia dell’Arte characters. The lovers, here Giasone (Jason) and Medea, are more in love with love and themselves than they are with each other. Cherry Duke in the trouser role of Giasone was spot on throughout a challenging race to keep two powerful queens in check. One of them, Medea, sung and acted beautifully by Hai-Ting Chinn, is a Morticia-like lover and mother. But even though her murder of her children by Giasone is hovering in the memory from myth, it seems unlikely to end this romp (and doesn’t.) Hai-Ting Chinn’s performed the incantation scene with effective eeriness. Cavalli's repetition of one striking figure to establish mood was characteristic. Others parodied this particular scene often in their operas as late as 1677. What a cast of characters. Taking advantage of a small space, they use the stage as a landing strip. Rushing up and down aisles, in and out doors, they never leave our imaginations. When Giasone was first mounted, opera was coming into the hands of entrepreneurs who carefully watched the bottom line. Small casts, there were ten singers on stage this evening, and imaginative rather than elaborate sets were common. These strictures four hundred years ago inspired this clever, beautiful production in small quarters. Costumes like the denim jacket with a golden ram’s head emblazoned on the back, which Giasone finds, brought on smiles of pleasure in the audience. We have here a story about Gods and Kings. For a long time, only royals and deities sang their dialogue. The humans in first opera audiences knew perfectly well that common folk did not sing when they spoke. But even Queen Hypsipyle’s maid, Sharin Apostolou, exhibited regal tones in her particularly beautiful, big voice. With their clarion basses, Mark Uhlemann and Patrick Murray also stood out in an outstanding cast. Most of the music is in the triple meter rhythmic pattern of popular daces. Occasionally there are gentle, melodic lines like Happy Delights in the first act. Laments on the ground bass were passionately expressed to contrast with their rigid form and often were the last line. In this first opera to separate arias from recitatives, Crystal Manich, in one of her many delightful directorial touches, broad and small, had the singers perform arias into a mike (which appeared to be dead, but an effective prop). This production is open and virile with a directness of expression that well represents the first great popular composer of opera. Wesley Chinn and his company make the case that Giasone should be as widely enjoyed today as it was in its own time.